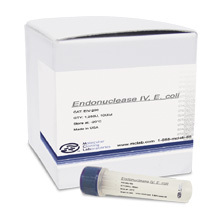 Endonuclease IV (E. coli) is a class II apurinic/apyrimidic (AP) enzyme that cleaves 5' to an AP site by hydrolysis, leaving a hydroxyl group at the 3' terminus and a deoxyribose 5'-phosphate at the 5'-terminus. 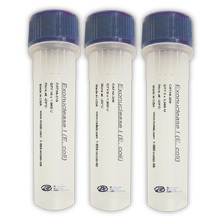 Endo IV can be used in vivo to repair free radical damage in DNA. E. coli cells with a cloned nfo gene. 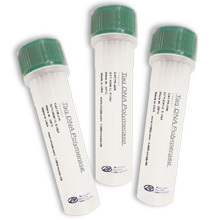 Endonuclease IV is tested in degradation of dsDNA and is free of detectable RNase and double-stranded exonuclease activities. 1. Izumi, T. et al. (1992) J. Bacteriol. 174, 7711. 2. Levin, J.D. and Demple, B. 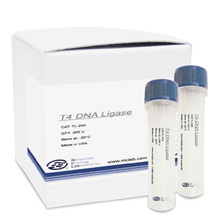 (1996) Nucleic Acids Res. 24, 885.